We here at Black Nerd Problems aren’t ashamed of being very intrigued by webcomics. It’s a great springboard for alternatives to the surplus of mainstream superhero tales that have flooded the market lately. The diversity (another word we’re partial to) of the stories and opportunities for independent creators grows a little more everyday. One that captured our hearts immediately was Al’Rashad: City of Myths, a sword and sorcery epic full of pirate action, political intrigue, assassination attempts, sewer monsters and an mysterious necromancer armies. 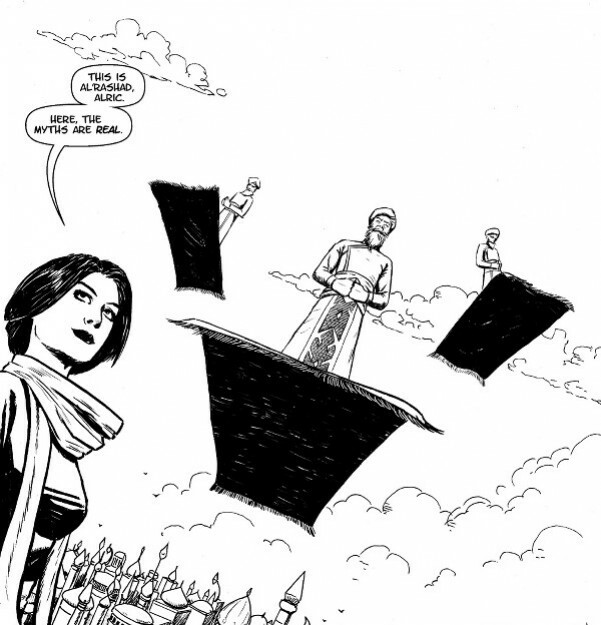 The tale was created by incredible artist Davinder Brar and writer, Christopher “Mightygodking” Bird, who some of you will know for his blog which features some of the most delicious Greg Land shade we’ve seen on the internet. Naturally, we had to sit down with the two of them for a few words…..
Black Nerd Problems: As I usually do, let’s start off simple: When did you start reading comics yourself? What exactly drew you to the medium? Davinder: I was pretty young when I started reading comics. The first two books I remember buying were GI Joe #14 and Uncanny X-Men #173. I got them off the spinner rack at my local 7-11. As a kid, I read everything I could get my hands on, and comics were just one more thing to consume. I can’t remember specifically why I started reading comics, but it’s words and pictures, how could I not be pulled in? BNP: Did you have any idea then that you would want to create comics yourself then? Chris: I didn’t know I wanted to make comics then. I mean, come on: I was five. 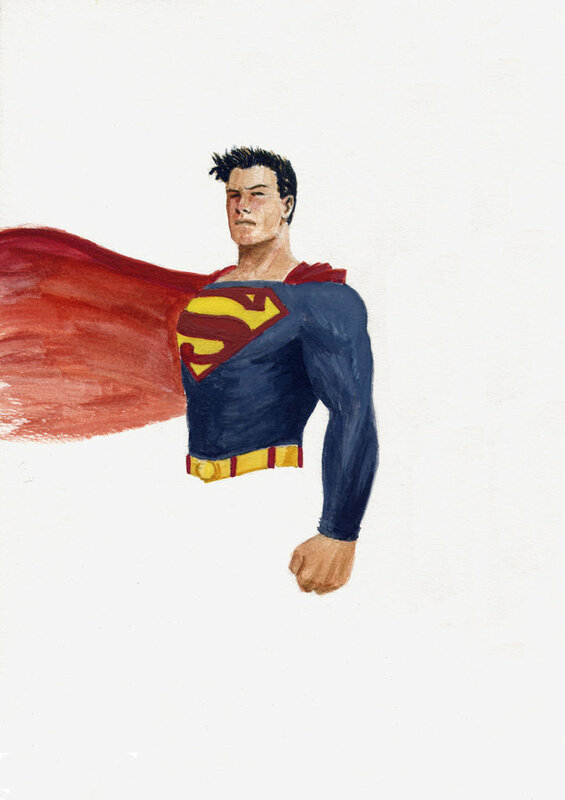 Davinder: I began drawing almost right away once I started reading comics. I always knew that even if I never worked on them professionally, I’d always be drawing for myself regardless. You know what’s interesting, now that I think about it? When I was really young I only drew my own characters. It was when I got older that I switched over to drawing existing characters exclusively. I feel like Grant Morrison would have something to say about that. BNP: Are there any notable writers that inspire your work? Chris: Alan Moore for the formal art of page construction and storytelling. Warren Ellis and Garth Ennis for dialogue and hitting those quiet beats that matter. Kurt Busiek for heart. Davinder: I think I’m influenced by almost everything I read. I was a huge Chris Claremont fan when I was younger. I’ve got entire swaths of Uncanny X-Men dialogue memorized, just by virtue of re-reading. Likewise with Frank Miller’s work, particularly The Dark Knight Returns. Alan Moore. Mike Mignola. More recently, it’s been Ed Brubaker. In terms of artists, Arthur Adams was the first penciller whose work I was able to identify. These days I gravitate towards more sparse styles, like Alex Toth, David Mazzucchelli, and the work that Stuart Immonen’s been doing over the past decade. I find myself referring to Ron Garney a lot. John Paul Leon. Hiroaki Samura. I recently re-discovered John Buscema’s black and white work and it’s been blowing my mind that I didn’t recognize just how great he was all along. I could list artists I’ve cribbed from all day. BNP: What comics are you personally reading right now? Chris: Right now I’m reading the Hickman Avengers books, All New X-Men, Moon Knight, Magneto by Bunn and Riviera (it’s an amazing book that nobody’s talking about), Thief of Thieves, Saga. Whenever Garth Ennis does a new Battlefields I pick that up. Online I read Girls With Slingshots, Order of the Stick andOglaf. I generally prefer reading volumes of things, though – I like books better than I like floppies, so periodically I go to the BMV (used bookstore) and stock up on OGNs and collections on the cheap. Davinder: Oh man, so much stuff. I moved over from monthlies to trades a while back, so I’m a bit behind in that respect. I recently finished an end-to-end read through of Locke & Key, which was terrific. I could’ve easily read another couple of books set in that world, but they really stuck the landing on that ending. I also just read Cullen Bunn and Brian Hurtt’s The Damned, and that was a great example of world building. Paul Tobin and Colleen Coover’s Bandette, Aaron and Ribic’s Thor: God of Thunder, Azzarello and Chiang’s Wonder Woman, Bendis and Immonen’s All New X-Men. I picked up a French comic called William and the Lost Spirit and fell in love with Matthew Bonhomme’s work. Again, I could go on and on. BNP: In the era where comic book movies have become a very lucrative genre for big budget studios, do you feel like the comics themselves have suffered or prospered as a result? Chris: I don’t think the comics have suffered because movies with vastly wider audiences have become popular, no. Certainly the fragmentation of Marvel properties among multiple studios isn’t ideal – not least because outside of Bryan Singer and maybe Sam Raimi, nobody who works on a non-Marvel film really seems to understand the characters, and Singer comes with his own specific baggage that makes his films harder to enjoy now (to say the least). But the worst case scenario is “more people recognize and enjoy Spider-Man.” I don’t see that as being a downside. Davinder: Interesting question. I remember reading an instructional book on comics art from the 80s, and they had this shot of Spider-man from behind perched on a steeple or something,with the city stretching out in front of him. The caption said something like, “In a movie, a shot like this would be so prohibitively expensive that no one would even bother, but a comic artist can knock it out with a pen and some paper. That’s something comics will always have over movies.” Now that effects are cheaper, that day is long gone. I think about that book a lot, and it pushes me to do things in comics that are unique to the medium. As far as movies go, I wonder about things like superhero fatigue, and whether people will still be flocking to the theatres for these films in a decade or two, but I don’t see them having much of an effect on the comics medium, positive or negative. You can make a Hellboy movie, but how can it possibly compete with a Mignola comic? BNP: Davinder, I know you took some time off from illustrating Al’Rashad to focus on your day job. What exactly do you do when you’re not helping create the “City of Myths”? Davinder: It’s funny, we’ve been working on this comic for over four years, so I’ve gone through a couple of career changes in that time. I was just leaving the video game industry when we started, and then I was a copy editor, but the few weeks I took off were because I went back to school and got my teaching degree. BNP: Chris, let me just be the one to tell you that you do a LOT of things. One could almost say you do “all of the things.” You’re a well-known blogger, a comic book writer, a television critic for Torontoist…..and a lawyer! I look at everything you do and I don’t see how you accomplish it all and still manage to stay on what seems like a fairly reliable schedule. How exactly do you do it? Chris: Truthfully, the blogging has taken a hit lately; I manage maybe one or two posts a week, not counting the weekly “here’s a page of Al’Rashad and here’s a link to my TV column” posts. Other than that, though, the answer is mostly down to me being a relatively fast writer and to planning my writing time out carefully outside of my day job in family law, and even then things can take a long time: the TV column is fun, but the other work I do for Torontoist can take a crazy amount of time to get done, not least because it’s more important stuff (political reporting for the most part, and the occasional obituary). BNP: Now, I’ve followed your work and I can honestly say that you’ve remained pretty classy in all aspects of your professional life. But, of course, what’s considered “classy” in some fields isn’t always seen as such in others. And these days, the internet is an employer’s best friend. Have the many hats you wear ever served as a detriment? 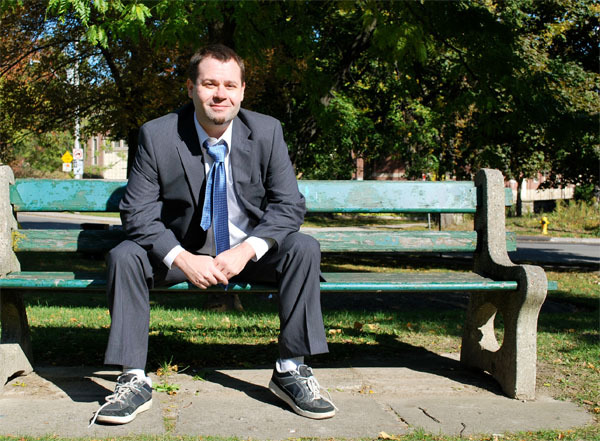 Chris: Partially trying to remain “classy” is because as a lawyer I have a professional obligation to be courteous. Partially it’s because I am sometimes forced to be classy:when I write for Torontoist I always argue with Hamutal Dotan, Torontoist’s EiC, about how harsh we should be in our criticisms of things – I always want to go full Hunter S. Thompson, she almost always wants to be more moderate than I am. Of course, she’s amazing and usually right, but I do still miss being able to throw down obscenities on a whim. BNP: I’ve read your “Why I Should Write Doctor Strange” series and it’s truly brilliant stuff. What is it about the Sorcerer Supreme that attracts you to the character? Does his current direction hold your interest? Chris: I like Dr. 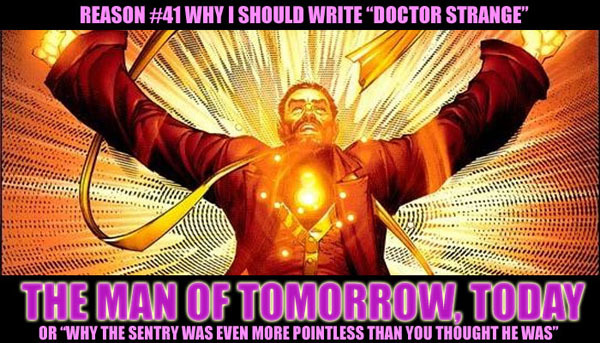 Strange for the same reason I like the Legion of Super-Heroes: you can write them, have all the benefits of the trappings of the Marvel Universe or the DC Universe, but also write stories that are very tangential to those universes (Strange because he works on an entirely different level than most of the rest of the MU, the Legion because they’re a thousand years in the future). I’m not entirely wild about how Strange is being used right now, to be honest. In New Avengers, Hickman is doing the “Strange resorts to the Dark Arts because he’s desperate” story thread again and that has been done many times before – in fact, it was almost exactly the last Strange storyline before he was “redeemed” as the Sorcerer Supreme. I like the idea of Dr. Strange being a MU equivalent to Superman: he’s the 800 pound gorilla in the superhero ranks, and the only reason he doesn’t make Everything Better Forever – other than being too wise to try – is because he’s busy taking care of all the top-level threats the Avengers and Fantastic Four and the rest will never know about. BNP: I know Chris has been very open about how he would love to write Doctor Strange. Is there any existing character you would love to bring a fresh take to? Davinder: I’m a fan of everything, so I’d be happy to draw any character. Imagine drawing something like Superman or the X-Men? That wouldn’t even seem like work. (I’m sure I’m being a bit naïve there). Dr. Strange appeals to me, as he does to many comics creators, in part because I don’t think there’s been a definitive take on that character in modern comics. Leaving aside the big two, while we’re speaking of existing characters, my background is in English Literature and an idea I’ve kicked around for years is doing a Shakespeare adaptation. I feel like there’s a natural link between comics and the stage. I’d love to do something like Othello in comics form. BNP: Now, let’s talk about Al’Rashad? First of all, you have an amazing gem on your hands. Once I finally got around to starting it, I binged through the whole thing in a couple of days. How did the two of you come to collaborate? What came first: the team-up or the idea? Chris: The idea came first – I first wrote it as a screenplay about fourteen years ago. (It wasn’t as good then, because fourteen years ago I wasn’t as good a writer as I am now.) In 2010 I decided “hell with it, let’s just do some comics” and it was an obvious choice. I asked on my blog “hey does anybody want to do a comic” and Davinder was one of the ones who answered (as did some other talented people, some of whom I have worked with since), and we immediately clicked creatively. BNP: One thing that immediately came to my attention about the story was that was the strong representation of characters of color. Certainly, Alric is anything but a “white savior.” And the presence of strong women is definitely felt as well. Was this always meant for this to be a focus going in or did it just come organically as the story developed? Chris: It was kind of the intent from the beginning. When I first came up with the rough idea in 1999, it was a bit marketing-driven to be honest – I thought “look, there are seven billion fantasy stories about European cultures and swords and elves and things. Let’s do something else, because then it’ll stand out.” And I started spitballing ideas, and “Lord of the Rings but in the Arabian Knights world” kind of stuck as an elevator pitch, so I started thinking about how to do that story. (When I was originally writing Kahal, I mentally pictured him as Djimon Hounsou. He’s moved on from that, though.) And a lot of elements remain from that. The Bokans were always going to be “what if the Malinese empire took the place of the Romans,” for example, just as the Gundring have always been “what if the Vikings were the ones who had the Renaissance? But, to be blunt: it’s better than it was as the original screenplay. I mean, fourteen years will do that: I’m better as a writer and I did make some conscious choices to emphasize the diversity of the cast. In the original screenplay, for example, Apali was male, and if you want proof that I’m a better writer now I think that’s the best proof there is, because Apali is obviously so much better as Rayana’s female role model (and it only took me a decade to figure that out, well done me). Rayana, for that matter, is more active a character than she was in the original draft – she was never a damsel in distress, but someone once commented that “she’s Kahal’s Brainiac Five” and that’s exactly what I was going for, the realization that she’s much smarter than Kahal is on multiple levels. (To say nothing of Alric. Alric’s not dumb, really, but he’s definitely an improviser as opposed to a planner.) Fezay’s role was greatly expanded, not least because he had a knack for getting all the good lines. And, of course, there’s that bit about a certain character’s sexuality – I won’t spoil it – but that arose when Davinder came to Toronto and we were having beers and spitballing a little, and I don’t remember which of us said “what if this one’s gay?” And we both knew that it worked, and not only that it worked but that in this story it made things work better, because now certain plot elements had underlying reasons for them that were both solid and tied the story back to the real world a bit. Diversity isn’t something we tossed in because we wanted to get progressive cred. Basically my attitude towards diversity in a story is as follows: character diversity is a weapon in every storyteller’s arsenal, or it should be, because diversity means more options and who doesn’t want more options when they’re telling a story? BNP: Are there any freedoms or hindrances you notice in particular about webcomics as a venue for showcasing your work? Is there any advice you would give someone who might be considering doing their own webcomic? The downside is that your audience can become spoiled and decide that they’re entitled to your work for free forever. I’ve seen it happen to other webcomic artists. It hasn’t happened to us so far – quite the opposite really, we have people asking us all the time when there’s going to be a print run (the answer is “soon,” and it’ll be a one-volume collection). BNP: Sell someone who might be looking for an alternative to the glut of superhero comics on reading Al’Rashad. Chris: I don’t think the comic really lends itself to an elevator pitch any more, oddly enough, because the entire story is effectively about the audience coming in halfway through to a conflict that’s been quietly rising for centuries in-story, and on top of that most of themain characters don’t yet realize how deep the whole thing runs (although they will soon; by the end of Al’Rashad readers will start to have an idea that we’re only just scraping the surface). I just generally go back to “what if Lord of the Rings happened in Fantastic Baghdad” and that’s a good starting point. Until the reader realizes that Fantastic Baghdad doesn’t show up for most of the first issue! BNP: With Al’Rashad coming to a close, have you given any thought to what’s next? Any new projects down the road? Chris: Al’Rashad is only half-coming to a close, because Al’Rashad is the first book in a trilogy – to be followed by Ra-Boka: Towers Of The Sun and Karabokorum: The Empire of the Walls. Davinder hasn’t committed to those – I mean, at some point you have to figure Marvel and DC will realize he’s more than ready to take on paying work – but I’m going to make sure they get done eventually, because Alric and Kahal and Rayana and the rest aren’t going to be finished just because they manage to thwart one lousy invasion.